How do I Choose the Best 7 Day Pill Organizer? The organizer's size depends on how many pills a person takes and the size of the average pill. The very simplest pill organizer is usually made of plastic. Each person may have different requirements when it comes to choosing the best 7 day pill organizer. After all, pills can be large or small, people may need to take more than one of them a day, and they might be able to use additional features like a timer or an alarm reminder. It’s also important to verify with pharmacists that it’s safe to combine multiple pills in a small container. Medicines that have special storage requirements, such as needing refrigeration, don’t make any kind of 7 day pill organizer a good choice. 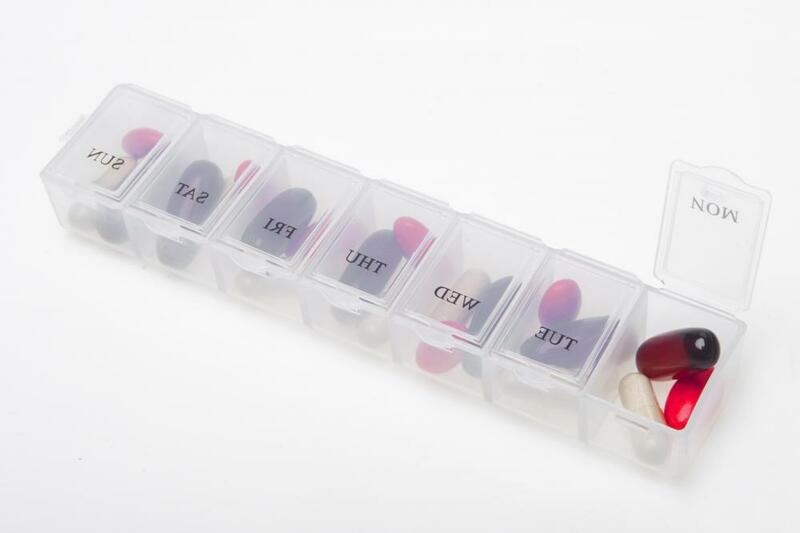 The very simplest 7 day pill organizer is usually made of plastic and features a slot to hold pills in for each day of the week. There is one crucial difference at this most basic level, of which people should be aware. Each day may open separately, or there may be a single opening for all days. The former is a much better choice. Any time the organizer is opened, the easiest method is to open a single medication day and remove the pills. This gets harder if all days are open at once. Inverting the container can mean dumping all the pills out, or losing one or more of them. It also can be difficult to stick a finger in each pill container slot to fish them out, especially with small pills. For these reasons it’s better to pay a little extra to be sure each slot is self-contained. Those wanting to find a 7 day pill organizer with greater features may look at pharmacies or online. For example, more complex organizers may have additional compartments for each day, such as labeled AM and PM boxes. For people who must take pills more frequently, some organizers may have as many as four boxes per day, or some companies make a vertical 7 day pill organizers with much greater storage room for each day’s medicines. One interesting variation is a tray with little colored boxes for up to four doses of pills daily. These do have the advantage of individual openings and they can be removed from the tray holder. On the other hand, if people put the boxes back in the wrong order, there could be confusion, and it might be easy to lose one or more boxes. Unless the organizer has additional features like alarms, the average 7 day pill organizer ranges in price from a couple US Dollars (USD) to about $20-30 USD for more elaborate designs. As stated, it’s a good idea to get a sense which of these designs will be most appropriate and most convenient. It’s also important to remember that many pill organizers are not childproof. They need to be kept far away from the access of any children. How do I Choose the Best Pill Splitter? How do I Choose the Best Automatic Pill Dispenser? How do I Choose the Best Pill Reminder?